It's clutter ground zero: raincoats, purses, backpacks, and gym bags. What It May Mean: Your family is distracted and eager to move on to the next activity when they get home. So they simply drop things as they walk in the door. 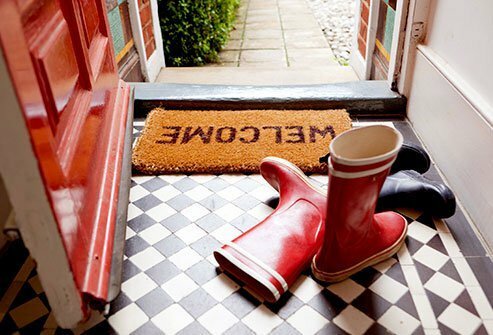 Think of the foyer as a launching pad, not a dumping ground. Leave only things that are ready to go out the door. 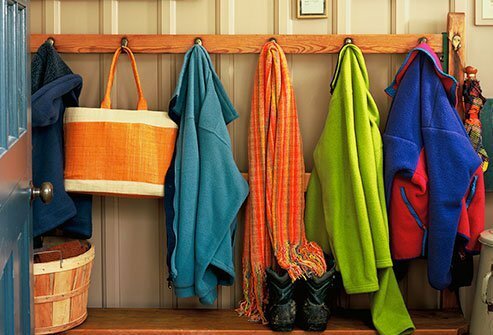 Use shelves and hooks on coat closet wall space. A tasteful tower of hatboxes can hold out-of-season hats, mittens, and shoes. Hold onto your sports gear when you walk in the door. The "finish line" for gym clothes is the laundry room, not the foyer. Equipment can go to the garage. 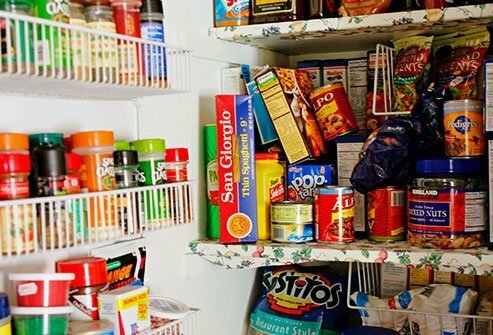 You can cram a lot of stuff in there -- cookie sprinkles, low-fat snack bars, industrial-sized bottles of ketchup -- even though it's probably hard to find what you need. You may even forget what's in there. What It May Mean: You're an impulse buyer -- you like to try new things or you can't resist a bargain. Or you buy foods you want to or think you should eat, but you never eat them. 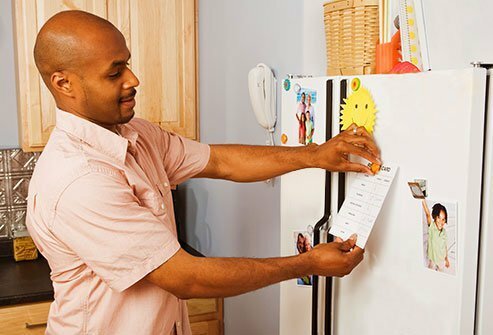 Check dates and get rid of foods that have expired. Think like a grocer: Group foods by type and label the shelves. Put things that you would use together, like baking supplies, in a box or basket that you can find easily. 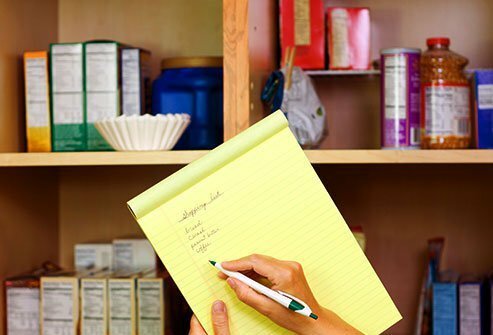 Check the pantry when you make a shopping list. Don't buy spaghetti sauce until you've used the jars you already have, even if it's on sale. Stick to your list when you shop. You may throw it in a box, stack it in neat piles, or shove it in a drawer. 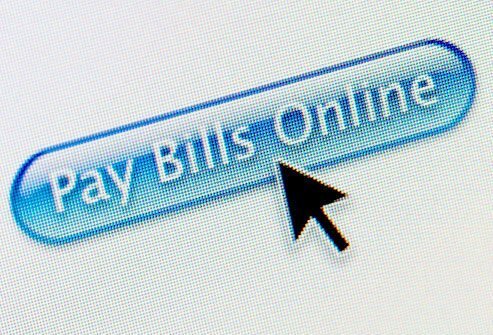 No matter how your mail piles up, it's a problem if you miss bills, report cards, tax forms, or other must-haves. What It May Mean: Snail mail clutter, like email inbox clutter, is often about putting off decisions, organizers say. You need to decide what to do with each piece, which takes time. You can sort and shred, but it's easier to cut down on mail. You can get most other mailed items online too, like magazines, newspapers, and concert schedules. 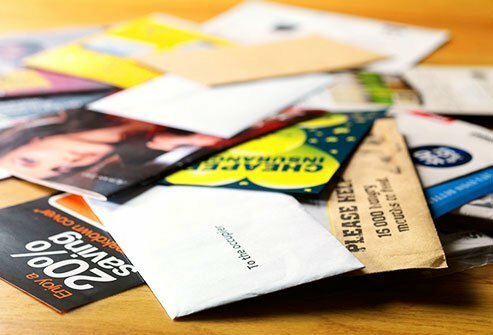 Snap a cell phone photo of junk mail you want to stop. There are free apps that can cancel it for you. What about those piles of catalogs, with pages you've marked for things you'd like to buy? Take a photo of the page instead. It's both a display case and mission control: schedules, phone lists, coupons, invitations, children's artwork, photos, souvenir magnets, and other things you want to remember. A typical door holds 52 objects that may cover 90% of its surface. 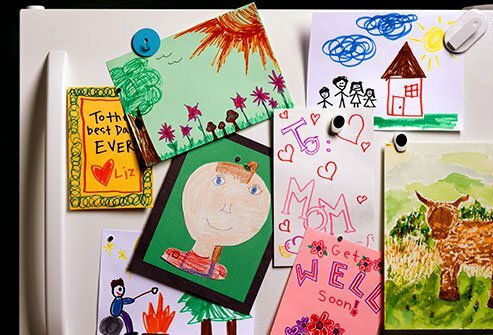 What It May Mean: You stick things on the refrigerator to remember the family's good times and must-dos. But there's so much there, you don't see anything. First, take down everything. Put mementos in a bag for two weeks. If you find you can live without them, discard. Move reminders like dry cleaning tags to your car or wallet. Once a week, like when you get gas, go through them and toss out the ones you don't need. Rotate magnets, photos, and artwork so you see them with a fresh eye. 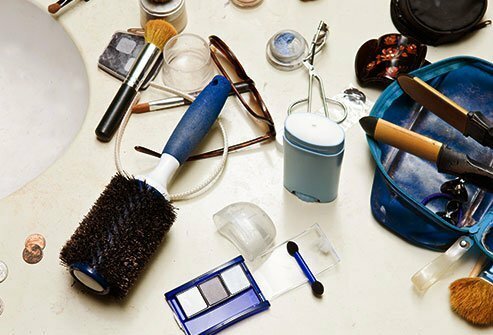 One bathroom counter might have many toothbrushes, shampoos, and skin-care products left out on it, as well as a jumble of makeup and a few stray toothpaste caps. What It May Mean: You're a perfectionist, always searching for the best products. Or you like to try new things. Or you can't resist "gift with purchase" buys. How many bottles of conditioner or lipsticks in the same shade can a person use at once? Limit it to one of each item per person. Give each person a shower tote or basket for his stuff. Keep them in cubbies or cabinets. 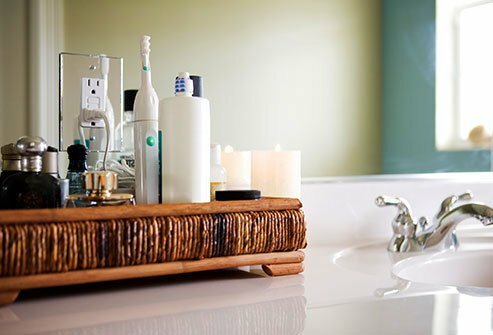 Arrange things that must be within easy reach on a tray to make bathroom cleaning easier. Make a rule: No one opens a new shampoo or other product until she finishes the one she already has. 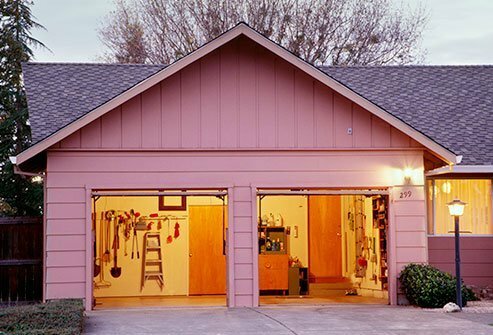 It's the bonus room for our material world spillover: About 75% of U.S. garages are too full to fit a car. Yours has big-box store purchases, a refrigerator to store extra food, holiday decorations, unused fly-fishing gear, and crafting supplies. What It May Mean: You like to stockpile food and supplies. You gear up for hobbies you end up dropping. You tell yourself that you'll sell your unwanted stuff online. Find a good home for items you won't use again. If you're not sure about something, put it in a box, tape it up, and date it. If you don't need to use it in 18 months, get rid of it. Use shelves to hold bulk supplies. Borrow or rent costly gear for a new hobby until you know you'll stick with it. Before you buy more seasonal decorations, check to see if you have room to store them. Everyone's got one. Some people have one in each room. 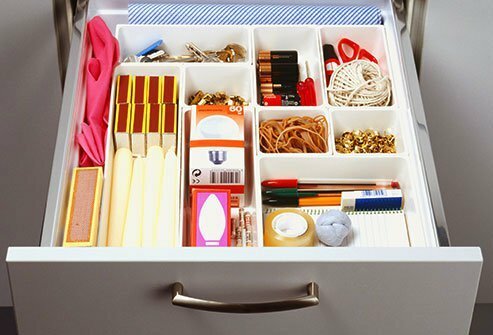 Many people love their junk drawer. It's home to all kinds of random things: batteries, birthday candles, stray buttons and tacks, change from various countries, stamps, tools, take-out menus, receipts, SIM cards, stamps, flash drives, and rubber bands. What It May Mean: You're normal. Take everything out and pile similar items together. Get rid of things like expired coupons and spare keys that you can't identify. Buy a plastic tray with dividers, or repurpose baby wipes or cigar boxes, mint tins, and mesh bags. Group similar items together. This can be a fun job for children on a rainy day. Dolls on the sofa, board books in the bathroom, train tracks down the hall. After your children (and their friends) play with toys, they don't put them away -- and you don't make them. What It May Mean: You have other priorities: You value creativity and play over neatness, or doing homework over picking up. Or your kids don't pick up because you don't. Or you buy too many toys. Make some rooms "no toy" zones. Toys left in them go into a penalty box to be earned back with chores or good behavior. Make a rule that your children -- and their friends -- can't start a new activity until they clean up the first one. Model good behavior: Let your child see you pick up your stuff. 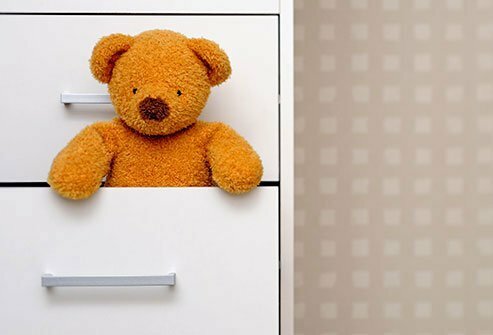 Keep it fresh: Put out one stuffed animal or one bath toy at a time. Rotate toys in and out of use. Greater Good Science Center, University of California, Berkeley: "How to Eliminate 'Junk Stimulus.'" Lynne Johnson, certified professional organizer; past president, National Study Group on Chronic Disorganization. Geralin Thomas, certified professional organizer; founder, Metropolitan Organizing; past president, North Carolina Chapter National Association of Professional Organizers. 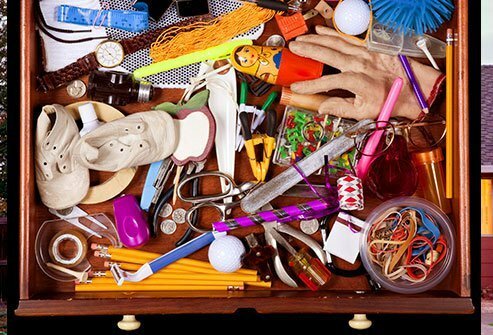 Michael A. Tompkins, PhD, psychologist, San Francisco Bay Area Center for Cognitive Therapy, Oakland, Calif.
UCLA Magazine: "The Clutter Culture." UCLA Newsroom: "Trouble in paradise: UCLA book enumerates challenges faced by middle-class L.A. families," "Gallery: Seven Common Challenges Facing Middle-Class Families at Home."